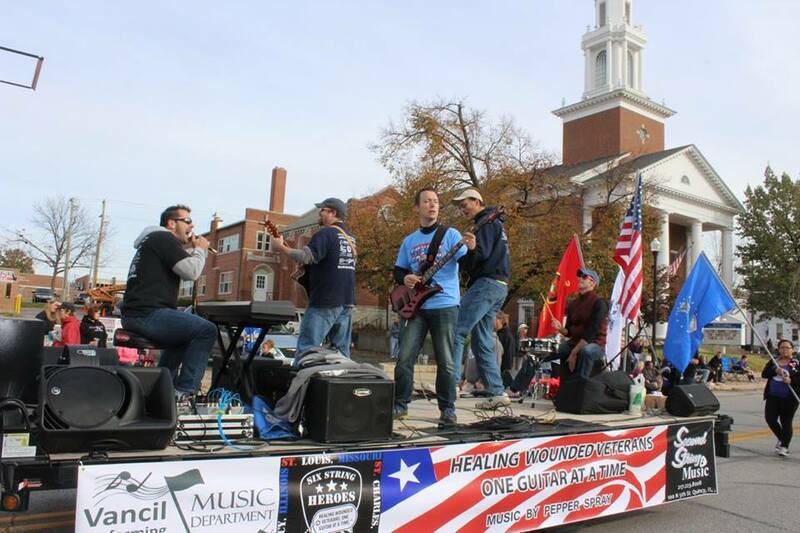 FOR THE SECOND straight year, our little jam band Pepper Spray played in the annual Veteran's Day Parade down Maine Street. We gathered Saturday morning at 14th and Maine, warmed up a bit, then rocked it all way to Fifth Street. Gosh, what great fun! Joining us again was Steve Stoner, co-founder of Six String Heroes in St. Louis and a Quincy native. "I don't know any of the songs," he said. "Neither do we," I said. "Three chords and the truth, baby." Pepper Spraying our way down Maine Street! Thank you, Frank Haxel, for your unwavering support of Six String Heroes and for putting together the float. Thank you, Adam Yates, for the PA system and unbridled enthusiasm for playing music. Thank you, Justin Sievert and Adam Duesterhaus, for playing Saturday and for making it more fun than you should be allowed to have. Thank you, guys from Tournear Roofing, for driving us, and thank you, all the kind folks from Vancil Performing Arts, for walking with us. Playing on a parade float is interesting, because so much stuff is going on around you, but you have to at least make an attempt to play the song and stay in the moment. I looked up and saw so many familiar faces, and before I knew it that G chord was botched into an H chord, and so forth. That's the thing about Pepper Spray - it's the original Second String Music jam band. We never practice, we never will, and we just want to play and have some fun, and it always works. One thing is for sure - we'll never play before that many people again, until next year's parade, anyway. Quincyans lined the streets and showed great appreciation for the men and women of our military. Adam Yates is a Marine veteran, so even I got into the Toby Keith patriotic stuff - you couldn't help it, knowing where Adam has come from, and especially because he's a law enforcement officer in a really uncertain world. Yup, even in little old Quincy, Illinois. Sheryl was in the store and said we were really loud coming up to Fifth and Maine. It was probably because of the tall buildings forming a sound canyon. This morning I saw a local news clip of interviews during the parade, and you could barely hear the people being interviewed. But you could hear Pepper Spray belting out Folsom Prison Blues! What a great morning, and God bless our military and the men and women who have made it happen and given so much.